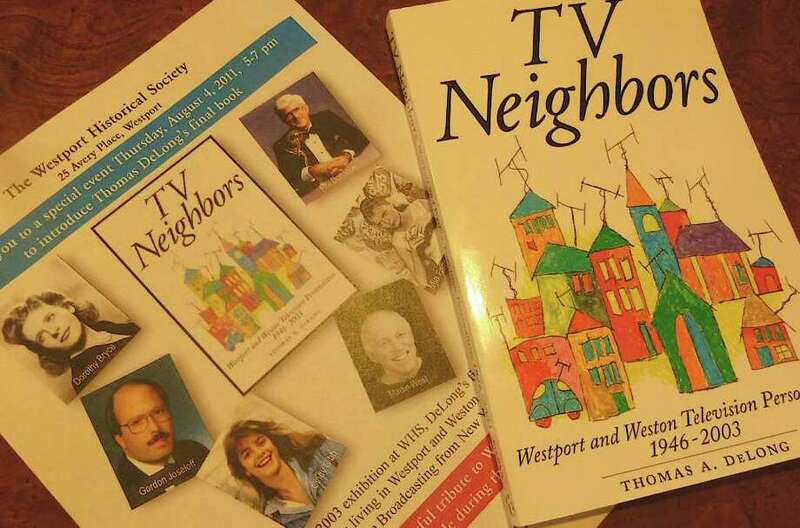 "TV Neighbors" by Tom DeLong and Wally Woods chronicles the television personalities living in the Westport/Weston area in the years 1946 to 2003. There are neighborhoods ... and then there are neighborhoods. Few compare with some of the extraordinary communities in Westport and Weston, which have counted -- and continue to count -- among their residents some of the best-known personalties in the television field. "Tom started the project in 2003, but passed last July before he could complete his work," said Susan Gold, the Westport Historical Society executive director, who introduced Woods. "His wife Cathy found the manuscript, turned it over to Wally and Wally took the initiative of completing it and getting it printed. This is a celebration of the completion and opening of a related exhibit." Sitting at a table in the Sheffer Gallery, stacked with copies of the book, Woods provided background about how he and DeLong became associated and the project developed. "We first met in 1996, when Tom came to the society with an idea to celebrate the 95th birthday of Francesca Lodge, wife of former Connecticut state Governor John Davis Lodge," Woods recalled. "We collaborated on an exhibit. Then he had the idea of having an exhibit highlighting the stars of stage and screen who lived in Westport and Weston in the 20th century, which we debuted in 1998. In 2000, we collaborated again, on an exhibit marking the 70th anniversary of the Westport Country Playhouse." Around that time, the Sheffer Gallery -- a then-new extension of the historical society -- was being constructed. Its inaugural exhibit was focused on TV Neighbors, with photos, scripts, vintage TV sets, advertising and more, related to the many Westport/Weston residents in the TV entertainment business. That exhibit inspired DeLong to think about creating a book around the same subject matter. "In 2008, Tom called me with the idea of turning the exhibit materials into a book," Woods said. "He and I were going to get together and do that. My wife Denise, who's a techie, was going to scan everything and Tom and I were going to do all the chapter headings, etc." Tragically, that game plan was interrupted in July 2010 when Tom's wife, Kathie, called Woods to say that Tom had suffered a stroke and died. "He was a dear friend," said Woods. "I asked Kathie if she minded if Denise and I finished the book. She agreed and gave us boxes of all of Tom's files. We went through everything, categorizing and formatting. Then we contacted the publisher, Bear Manor Media, who gave us a greenlight. It was printed last month and is being introduced here today." One of the TV personalities on hand for the reception was actor/writer David Rogers, with wife June Walker Rogers, Westport residents since 1967. Rogers' TV experience includes four episodes of "Law and Order," writing for the "Carol Burnett Show" and working with Jackie Gleason. Rogers is a founding member of the Theater Artists Workshop as well. "Many actors have lived here and still do," said Rogers. "One of the main reasons is the convenient commute to New York, where much of the business is based. Christopher Plummer still lives in the area, and Eartha Kitt. This is a creatively stimulating area. Our Artists Workshop has helped carry on this tradition." "I played different character roles, from 1961 on, for several years. Then I had a seven-year run on `General Hospital,' playing character Phil Brewer. From 1978 to 1980, I played Don Hughes, one of the Hughes brothers in `As the World Turns.' "
Martin had been living in California early in his career, but moved to Westport in later years. About being featured in the book, he said, "I'm overwhelmed and didn't know it was going to happen. And it's great to see so many familiar faces here." Many around town may not know, or recall, the role that Westport First Selectman Gordon Joseloff, who was in attendance, played in the industry. "I was with CBS News, in both TV and radio, from 1975 to 1991, as a writer, producer and correspondent," he said. "As a correspondent, I was on-air, on TV, in New York, Moscow and Tokyo." Joseloff said he "knew Tom (DeLong) for years and worked on the original exhibit with him. This book puts into words and pictures a bit of history about Westport and memorializes the great artistic heritage our community has." Offering another perspective was Sandy Stumberger, who funded the establishment of the library space at the historical society. "In the late 1960s, there was no Sunday matinee on Broadway, so all the actors would gather on Compo Beach," she said. "I would go with my sons to the beach and all around us would be TV and theater people. It was a Who's Who of show business ... quite unique. We had come from Cincinnati and there was nothing like that there." Among the noted Westport/Weston performers from the period 1946 to 2003 featured in "TV Neighbors" include: Pioneers: John Lodge. Drama: Bette Davis, Joanne Woodward, John Malkovich, Alan Arkin, Mia Farrow, Tina Louise, Christopher Plummer, Michael Douglas, Mariette Hartley, Jack Klugman, Paul Newman. Comedy: Christopher Lloyd, Madeline Kahn, Brett Somers, Marlo Thomas, Eva Gabor, Imogene Coca. Soaps: Martin West. Music & Dance: Eartha Kitt, Neil Sedaka. Hosts: Don Imus, David Susskind, Phil Donahue, Rod Serling, Martha Stewart. Broadcast Journalists: Harry Reasoner, Gordon Joseloff. Sports: Brent Musberger, Bob Costas, Jim Nantz. Sitcoms: "Come to Westport," "I Love Lucy," "Bewitched" (originally titled, "The Witch of Westport").